One of the things I really like about unconferences is that there is very little "gyan" and a lot of experience sharing. This came home to me when participating in a session on hiring. The question was: "What strategies do you follow for hiring and building a team?" This same topic was discussed in a panel in the NASSCOM Product Conclave last year, with some VCs on the panel. In typical panel style, a lot of gyan was thrown around: "Hire only the best people", "Top people create top teams" etc. That's stating the obvious. I mean which startup doesn't want to hire the best people? Do these VCs believe startups are intentionally hiring poor people because they believe its a better strategy?? At the end of the panel, the audience is usually unsatisfied. The panelists tell them what they already know without a word on tackling ground level challenges that they face. Now compare that with an unconference. Once more this topic came up at the TiE unconference. Look at your requirements - not all types of work require the best people. Some types of work are repetetive and may just make good employees bored. These are strategies that are coming from the experience of people who actually have to tackle these on-the-ground problems. At the end, the participants feel charged up with ideas to take back and implement the next day. This is really what makes an unconference different for me. The focus on real solutions to real problems is invaluable. I was looking at the position papers for the TiE Unconference. Position papers are topics that participants want to discuss at the unconference. You may have an initial hypothesis about why your product is useful to enterprises. How do you validate it? There are several factors: which customers to reach out to feedback? How do you identify the *right* person within the org. for feedback? How do you evaluate their response? etc. How does an entrepreneur determine if his product really has a market fit that can guarantee rapid growth for the enterprise? The question becomes relevant when the product addresses a latent need that is not very explicit in the market place. What are the typical pointers to a 'successful' or an 'unsuccessful' product? Bootstrapped startups have very low or nonexistent marketing budgets. If you're making a product for the global market, how can you make sure your product is found by the right people? We are a young startup with a service offering of online ERP and HR software. We are facing a lot of roadblock in marketing SAAS to our target clientèle (which are mostly old-style brick and mortar firms) and especially with a slim sales force. Would like to see if some inputs could be got on this. We are a startup with a service offering of Management Consultation and Leadership training. We are facing a lot of roadblock in marketing our Webinar to the right audience inspite of knowing them. Would like to see if some inputs could be got on this. The idea is to understand the dynamic behind catching customers into a cloud and to retain them by providing continuously improved services. Building a product that can be consumed online implies that it's location agnostic. How to target companies in the valley being in India ? Is it a necessity to be in the US? Would like to hear about market entry experiences of product startups with specific reference to early stage high yield marketing techniques. For TiE education, Mentoring and Networking are the pillars. These are delivered through various events in different formats: Talks, My-Story sessions, Panel discussions, Member networking sessions, Unconference (from now) etc..It will be useful to know how our members value these and what additional or alternate delivery formats and activities should we consider to be relevant and aligned with our members' expectations. To understand better where TiE stands in the entrepreneur ecosystem today, and what role do start ups think TiE can play for them and how? There is no dearth of ideas on solving problems. How can we leverage all the collective intelligence in the high tech industries to foster social innovation. How can we leverage technologies to improve the life of rural folk? How do we identify great co-workers ? How do we build a team that lasts through the rough years ? How do we build a team that creates great products ? The difference starts from recruitment, development, environment and also the technology. The things to be taken care for getting the people shift their base from project based working to products. We started out with a theme - How do you find your first customer? Suresh pointed out that we need to differentiate between customer (who pays) and a user (who uses the software). What we really need in the beginning is a user who can validate our assumptions. Once you have a validated model, then it is a lot easier to find a paying customer. The conversation went on to How desperate is your customer's need? The more desperate the need is, the easier it is to find and sell. Sometimes entrepreneurs work on products that that are not solving really desperate problems. A company may have a hundred problems, but stakeholders only have time to only solve 5-10 of them a year. Is the problem you are solving in their top-10? Imagine a bank with a line as customers wait for an hour to cash paychecks. You have a product that could reduce waiting time to ten minutes. You meet the president and tell him you have a product that could solve his problem. What does the president say? "Yes I feel bad about it and give them cups of water" - They know they have a problem but are not motivated to solve it. It's not an important problem to them. "I requested our IT department to develop a solution, but it doesn't work and keeps crashing." - Hot. They have a problem and are spending money on solutions, but nothing works. In case we thought the last type of customer doesn't exist, Dorai told a story of how he was talking about his vision to a customer and it was such a desperate problem that they paid him in advance to create a product to solve it. You know you have a market when customers are willing to part with their money even before you have started development. Steve Blank calls these customers "Earlyvangelists". This tied in with the theme of a track at the upcoming Nasscom Product Conclave, which is Sell, Develop, Market, Sell. In other words, first sell your vision, and get someone to buy into it. Only then start with development. Where most of us think of selling as the last step, it really should be the first one. From there we went into Steve Blank's Customer Development method and Naeem Zafar's 7 steps (links above). Both methods advocate having a customer to validate assumptions even before you start development. and the pros and cons of each method. With that we broke up for networking. Here is an image from a GoToMeeting's webinar page. I've logged into the webinar and it tells me to come back at another time. Now I have to go to a timezone page and figure out the local time when this event is happening. And if daylight savings is involved there is a really good chance that I'll be off by 1 hour end end up missing the event. This is not just an issue with GoToMeeting. I've seen it time and again with most webinar providers. And I've missed my fair share of webinars because of messing up the conversion (especially with daylight savings involved!!). Or, at least have a message like "This webinar starts in 12 hours, 45 minutes". That way I get a fairly good idea of when it's going to happen. 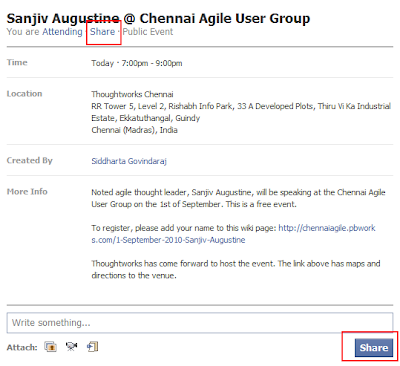 At today's Agile Chennai event we tried using Facebook's live streaming widget to live stream event updates. There were a couple of major problems which prevented it from really being useful. Anyone know of solutions/workarounds to these? The image above shows an event page in Facebook. Notice that there are two links called Share (highlighted in red). The top link shares the event with your friends on your profile. The other one, much more prominent, just writes on the event wall for other attendees to read. What is the chance of mixing them up (or even missing out the top link entirely)? I've seen instances where people intending to share the event with their friends use the link below, and end up writing on the event page wall. Is there a way to make this clearer?